Claudio Rinaudo lives and works in Palermo where he was born in 1932. He is a founding member of the Circolo Culturale "Giacomo Giardina" of Bagheria and a member of the A. N. C. I. S. International Association. He first started writing in 1980 with poetry in Neopolitan and then progressed to Sicilian where he found his stride and started collecting prizes and critical acclaim. He has experienced particular success with his humorous works, cabaret texts, songs, and theatrical plays. 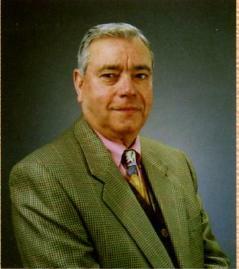 His publications include: Pinsannu Pinsannu (1997), U Lampiuni (1998), and 2000 Risate (2000). This poetry selection is a sample of his sometimes sardonic humor. senza bisognu di la cassa mutua. si metti 'ntà la tazza, s'arrimina. nenti di menu ca campò cent'anni. -Ma comu potti fari? Zu Giuvanni? arrè vi l'haju a diri? Don Totò? stetti mutu e si fici i cazzi sò. Rinaudo, Claudio, U lampiuni, Thule, Palermo, 1998, p. 77.
you won't need to go to the bank. put it in a cup and stir. who lived no less than a hundred years. -But, Uncle John? How could this be? Mister Sal, must I tell you again? he spoke little and didn't meddle. nni manca l'acqua di sutta li peri. mancu putemu mettiri li fasoli! a li pomperi po' telefonari. l'acqua è cuntata e nun la poi spriari. e tantu abbili, certu, nun li fazzu. nni sparagnassi anticchia p'a latrina! mancu si pò lavari u... nasu e u coddu. lu baccalaru siccu nun l'ha vinnutu. dici: "'nto vinu, ora, chi cci junciu?" pirchì di certu nun ci pò arrivari. t'a stari mutu e nun t'a lamintari! EDITRICE, Delia (CL), 2000, p. 112.
to water we can bid our goodbyes. out of the question, we can't plant beans! the water truck you'll need to be calling. water is tallied, for cleaning there's nought. most of my needs are left on the shelf. a bit for the toilet would not be so hard! we can't think about washing our... nose and neck. he has sold none of the cod that he's dried. saying: "to the wine I can't add, I feel lke a clown?" He can't say "I've had it with water up to here"
because there's no water, about that it's clear. you need to be silent, ne'er a solution demand!